A hospitals trust "must improve" the safety of its emergency care departments, inspectors have found. 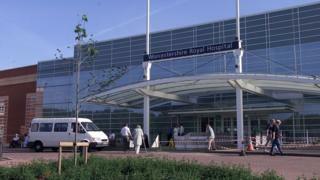 Concerns surrounding ambulance handovers and overcrowded departments at the Worcestershire Royal and Alexandra hospitals were raised. The numbers cared for in emergency department corridor areas must be reduced, watchdog the Care Quality Commission (CQC) said. The trust, rated as inadequate, said it will "change things for the better". But it said it welcomed the CQC recognising hard work emergency departments staff were making daily "to deliver the best, safest care possible... in very difficult circumstances". The watchdog said the Worcestershire Acute Hospitals trust must improve "urgent and emergency services to ensure... timely and safe care". CQC chief inspector of hospitals, Professor Ted Baker, said it found services were "stretched and overcrowded" due to the numbers requiring care. "This had resulted in people waiting considerable lengths of time to be assessed and treated as well as there being insufficient beds for people to be moved through the hospital," he said. The watchdog found staff were "caring and compassionate" and there were sufficient nursing staff on duty, he added. Trust chief executive Matthew Hopkins said it would not accept the "routine use of corridors to care for patients, or the long waits that keep ambulances off the road, or the conditions that our ED (emergency department) teams are currently working in". He said it had "taken action since our most recent inspection to improve waiting times" in emergency departments and reduce ambulance handover waiting times. Mr Hopkins said these actions included opening more beds at the Worcestershire Royal and the Alexandra site in Redditch. The inspection was not rated and does not change the overall rating for the trust, which is in special measures.